More rugged. More refined. More fun. The world leader in off-road vehicles brings you the all-new 2019 lineup of vehicles that perform better, work harder, ride smoother and deliver the ultimate riding experience. Plus, your military buying benefits just got better! All Polaris vehicles now include a 3-year Extended Protection Plan FREE of charge as part of your overseas military benefits. * This free benefit is valued at up to $1,700. 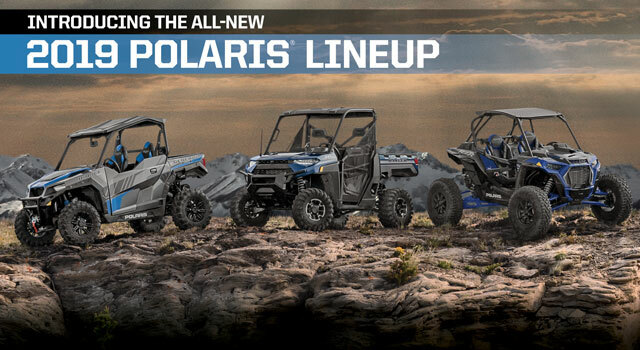 Ride with confidence, Polaris and MAS have you covered. A Polaris Protection Plan covers over 1,500 parts! But to keep things simple, the plan covers the engine assembly, transmission assembly, primary assembly, electrical wiring and Components, Ignition and Starter, Fuel System, Cooling System, Suspension, and Drive Axel Assembly among other components. Wear items (batteries, belts, wheel bearings, etc. ), abused units, neglected units, or cosmetic damages are not covered. * Please see the terms and conditions for the full list of exclusions. POLARIS FACTORY SERVICE: Factory trained service and Polaris Engineered™ parts at all 1,500 Polaris dealers in North America. NO STRESS: Hassle free claims process directly through Polaris to ensure you’re back riding as soon as possible. TRANSFERABLE: Increase your resale value with unlimited transfers on your Polaris coverage for the life of the plan. *Highlifter models excluded. Any modifications or alterations made to the unit that go beyond any factory installed Polaris Parts, or any part that would contribute to the mechanical or electrical failure of covered parts per your contract, are not covered under the extended service contract. Ask a sales representative for complete protection plan details.